Thursday, September 1st, mom had Miss Nancy snap some pics of me while I was at school. I'm starting to enjoy my bigger kid classroom and all the big kid toys that go with it. We even get snack time (notice my BFF Matthew to my left has moved up from my old room) at the table together. It being a church school, we also get chapel time where we learn stories and sing songs about the big man himself. I came home with my first ever case of diaper rash the day before so here mom is letting me get aired out. I've started enjoying some one on one time wrestling with Porter. Sometimes I let her win. Friday 9/2 was a BIG day. I went on my first ever airplane ride. Mom and dad decided to trek down to Florida to give me a test run to see how I'd do in preparation for Thailand flight. Because a 2.5 hour flight and 24 hours flight are pretty similar. Right? Hanging out in the hotel lobby. Why won't my boat go anywhere? After a decent night's sleep (considering I slept in the same room as dad's snoring) we headed to the beach! My first sight of the Ocean (aka Tampa Bay). I wasn't so sure about the sand but got used to it after some gentle convincing by dad. After a mid day nap we had some lunch and hit up the aquarium. Sunday was more beach time, some shopping, a trip to the G.Wiz kids museum, and then finally some pizza dinner. I think the best part of the trip was getting to put black olives on my fingertips before shoving them into my mouth. Overall, I did a lot of lounging and really enjoyed the hotel, especially getting to sleep with mom and dad 1/2 of each night! I take it back. The best part wasn't the olives, it was the doggies at the airport. 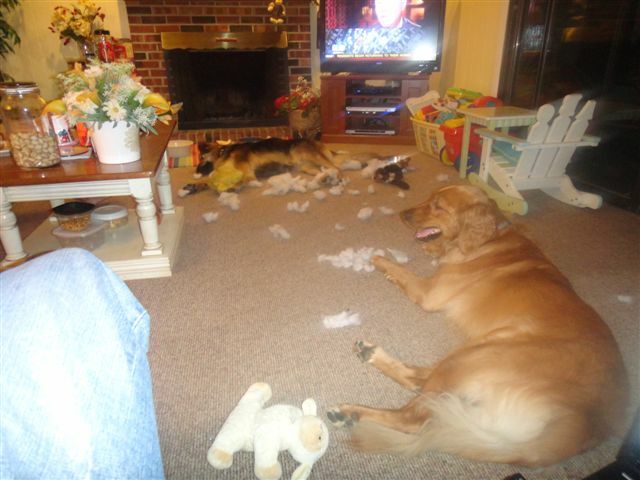 Here's what my doggie's did to Gma and Gpa's house while we were gone. When I got home Monday evening (after another rather uneventful flight) I went to BobBob and Ta's to collect my own doggies and guess who was waiting for me at the house?!? Na Yui! Tuesday was back to school. But to keep the memories fresh, I put together a video montage of my trip. Enjoy! P.S. It's my friend Amelia's 1 year birthday today! Sorry we missed your party, but I'm sure it was a GREAT time!